Barneo, the North Pole ice camp. Our latitude is 89N and 20E, outside temperature -27oC, you could be fooled into thinking that you are on land, but in fact under the 2 m of ice there is 2,000 m of water. Barneo is a public camp, run by Russians and populated by polar explorers and thrill seekers, plus scientists. To get here you fly through the Norwegian Spitzbergen islands, and it is here that I met up with the group from the University of Washington that operates the North Pole Environmental Observatory. A couple of days to sort through all the equipment that was shipped here over the last year, and we are ready to head to camp. It is a 2.5 hour plane ride to Barneo and we arrive at lunchtime. As I only have 3 days here I was eager to find a location for the buoy and get it deployed. We spent our first day searching the surrounding flows for a good spot. The ideal location is a flat ice pan surrounded by ridges, the fracturing of the floe will most likely occur at these ridges, meaning that as summer progresses and our floe drifts south, our buoys will hopefully stay intact in the middle of the floe. There is plenty of tea, coffee, hot chocolate and cookies available in the mess tent, and we retire there every few hours to warm up and refuel. With my satellite phone I am able to stay in contact with Pacific Gyre and keep them updated on my progress, it also enables me to call home and let everyone know that we are ok. While we are looking for our perfect buoy location, I turn on the WARM buoy GPS, so my colleagues can at least see that our camp is drifting south several miles a day. Each day the plane arrives with more adventurers and several dog teams cycle through the camp. It is always funny, as the dogs are so excited to be on the ice, they start howling when individual dogs are harnessed up, it’s as if they are worried that they will be left out of all the fun! Sunday comes around and we spend the morning, collecting ice core samples, and measuring light profiles, we are just waiting for a snow mobile team to drag the buoy over to our location. This finally happens at about 4pm local time. We have 24 hours of sunlight so we can work at any time of the day or night. It only takes 30 minutes to unpack all the sensors and feed them down the 10 inch ice hole. After this I call Pacific Gyre to make sure that all the sensors are uploading. Back in California they can even see the crack in the ice from the below ice camera at 20 m. With the news that the buoy is working I can breathe a sigh of relief, and just like that my Arctic field season is over for this year. 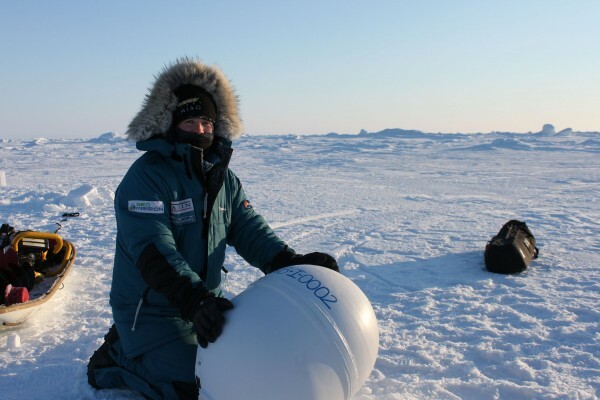 While I make my way back home, the rest of the team here have several more buoys to deploy both at camp and at various locations around the pole. I am hoping that I can come back next year, now I have seen the camp, I have some ideas for experiments to conduct while I’m here.